Chusonji is situated on the top of a hill named Kanzan, and often called Kanzan Chusonji. According to temple records, it was founded in 850 by Ennin (Jikaku Daishi), a monk associated with the great monastery Enryakuji and third head abbot of the Tendai sect. Ennin is also known for the autobiographical record of his travels and study of Buddhism on the continent, regarded by some as one of the world's greatest travelogues. It was in the early twelfth century that the first Oshu Fujiwara lord, Kiyohira, began the construction of a massive temple complex of halls and pagodas here. According to the Azuma kagami (the official history of the Kamakura shogunate), there were more than 40 halls and pagodas, and over 300 monks' residences. Kiyohira intended that Chusonji would placate the spirits of those who had died, either friend or foe, in the bitter conflicts that had dominated Tohoku in the latter half of the late eleventh century. He further wished to create a peaceful state based on the principles of Buddhism. In the dedication pledge for Chusonji, known as the Ganmon, Kiyohira writes that all travelers, regardless of status, would be greeted affectionately by the Buddhas and without fail to receive their blessings. Chusonji's merits were to be distributed evenly and universally to all who desired them. Kiyohira's son Motohira inherited this great vision and commissioned his own great temple, Motsuji, which was completed by his son, Hidehira. In turn, Hidehira commissioned Muryokoin Temple. This was close to Yanagi no Gosho, which appears to have been a government complex of diverse departments from which the Oshu Fujiwara administrated their Tohoku domain. Hiraizumi flourished for nearly one hundred years, a time of peace and prosperity. However, hostility from the Kyoto court and the emergence of Minamoto no Yoritomo's regime in Kamakura eventually dragged Hiraizumi into the violent political upheavals of the late twelfth century. When Minamoto no Yoshitsune, younger brother and former general of Yoritomo, fell out with his elder sibling, he fled to the north to Hiraizumi, but soon after he arrived, his protector Hidehira fell ill and died. Hidehira's heir, Yasuhira, was unable or unwilling to handle Yoritomo's pressure to hand over Yoshitsune, and in early 1189 attacked the fugitive general, forcing him into suicide. Yet this was not enough to appease Yoritomo, who attacked Yasuhira and brought the curtain down on the century-long Fujiwara dynasty. Chusonji's fortunes changed drastically in the succeeding Kamakura period. In 1337 fire consumed many of the temple's halls, pagodas, and treasures. Nevertheless, more than 3,000 National Treasures and Important Cultural Properties survived, principal among them the Konjikid?, the small, golden Amida hall which was the first structure designated a Japanese National Treasure. The significance of Chusonji's treasures is that they form an integrated collection of many different crafts, including lacquer work, woodwork, metalwork, dyeing and calligraphy all of which represent the pinnacle of Heian period Buddhist art in eastern Japan. It is our sincerest hope that this booklet is of value to all who visit Chusonji, and that it helps you to personally experience both the dreams of Hiraizumi's Oshu Fujiwara and the blessings of the Buddha. 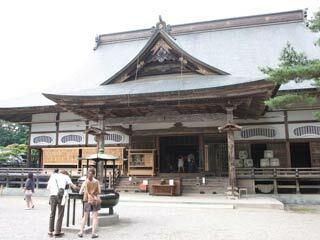 In 1057, Shogun Minamoto no Tomoyoshi and Yoshiie visited here and prayed for their victory. Enshrines the principal image of Yoshitsune and Benkei. built by Kiyohira, and moved here in 1657. The secret principal image of this hall was made by Priest Jigaku. This bell is one of the important cultural property of Iwate Prefecture. It is Banshikicho - style bell cast in 1343 on the initiative of Raiei, a priest of the Chusonji Konjikido. The bell stand has become hollow after long years of striking, and thus the bell is no longer rung. The inscription on the bell says that the temple building on top of the mountain was burned down in 1337. This is also a valuable historical source for the period after the fall of the Oshu-Fujiwara clan. Its diameter is 86 centimeters.